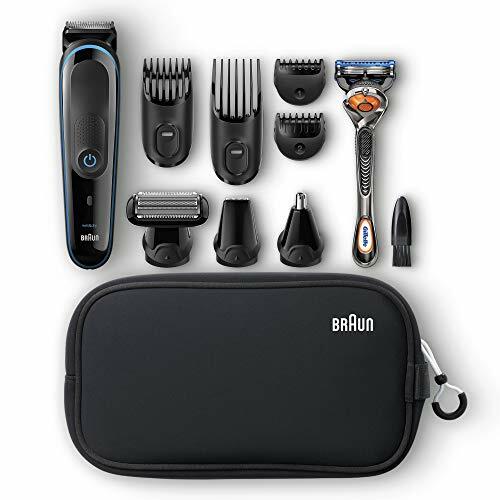 Discover one of Braun’s best gifts for men with the new All-in-one trimmer MGK 3980. Achieve a range of different lengths (0.5 – 21mm) for hair, beard and body trimming. 13 length settings and lifetime sharp blades for ultimate precision. 9-in-1 kit; includes face & beard trimmer, detail trimmer attachment, ear & nose trimmer, hair clipper, body groomer. Plus free Gillette Fusion5 ProGlide razor with FlexBall technology for clean shaving. 60 minutes of precision trimming from a 60 minute charge. 100% waterproof rechargeable trimmer, cordless in-shower use for maximum flexibility.